All over the world, threading through a multitude of diverse cultures, and as some scholars assert, perhaps originating in prehistoric times, there has been passed down a legend of a heroic, selfless greyhound. The beloved companion to a nobleman, chief or king, and the guardian of this esteemed person's only heir. And always the story ends in tragedy, with a case of hasty judgment, rash actions, inconsolable regret, and lifelong penance. 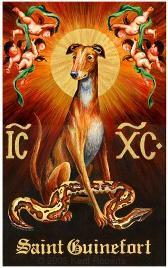 But, only in Medieval France did this story take such a hold upon the hearts of its people and grow roots so deep into the Gallic soil and soul, that this legendary greyhound would literally be sainted by the populace and prayed to for aid and healing, particularly of children, for more than 700 years. The name of this holy dog-martyr, according to French legend, was Guinefort. The earliest text documenting this cult is recorded from the location of its actual shrine, a sacred grove in the woods near the small village of Sandrans, in Dombes, north of Lyon (figure 1). In the diocese of Lyons, near the enclosed nuns' village called Neuville, on the estate of the Lord of Villars, was a castle, the lord of which and his wife had a baby boy. One day, when the lord and lady had gone out of the house, and the nurse had done likewise, leaving the baby alone in the cradle, a huge serpent entered the house and approached the baby's cradle. Seeing this, the greyhound, which had remained behind, chased the serpent and attacking it beneath the cradle, upset the cradle and bit the serpent all over, which defended itself, biting the dog equally severely, Finally, the dog killed it and threw it well away from the cradle. The cradle, the floor, the dog's mouth and head were all drenched in the serpent's blood. Although badly hurt by the serpent, the dog remained on guard beside the cradle. When the nurse came back and saw all this she thought that the dog had devoured the child, and let out a scream of misery. Hearing it the child's mother also ran up, looked, thought the same thing and screamed too. Likewise the knight, when he arrived, thought the same thing and drew his sword and killed the dog. Then, when they went closer to the baby they found it safe and sound, sleeping peacefully. Casting around for some explanation, they discovered the serpent, torn to pieces by the dog's bites, and now dead. Realizing then the true facts of the matter, and deeply regretting having unjustly killed so useful a dog, they threw it into a well in front of the manor door, threw a great pile of stones on top of it, and planted trees beside it, in memory of the event. Now, by divine will, the manor was destroyed and the estate reduced to a wild land, and so was abandoned by its inhabitants. But the peasants, hearing of the dog's conduct and of how it had been killed, although innocent, and for a deed for which it might have expected praise, visited the place, honored the dog as a martyr, prayed to it when they were sick or in need of something..."
It is at the end of his text that de Bourbon assures his audience, the Church authorities, that he then called together the residents and had them destroy the shrine, which included burning the remains of the dog. Or so the righteous friar thought, for the peasants "proof" of this destruction must surely have been falsehoods created to appease the monk, and more importantly, to thwart the wrath of the Holy Roman Church. The least of this wrath could involve the seizure of their meager yet essential possessions, the most of it could mean the loss of their lives. For not only did this shrine continue to exist for another 700 years, researchers to almost the mid twentieth century found evidence of its viable use. The reverence that the people of the Dombe region had for their little saint was stronger than their fear of retribution by a very powerful force. Why did this tale resonate so deeply in their hearts? What are the possible origins of this story, and why have such similar stories survived for millennium across the globe? That the greyhound (from the Saxon word grighund) or, at least a definite sight hound type, has been the hunting and fireside companion of humans since prehistoric times is found in the evidence of these dogs' ancient skeletal remains amongst human ones, and in cave paintings showing the distinctive shape of the sight hound (deep chest, long legs, torso and neck), usually alongside human figures engaged in hunting scenes. The languages these stories are told in, and in what venues, also attest to the longevity of this archetype. We find it in Sanskrit in the Panca-tantra. It also exists in the Persian, and Hebrew. 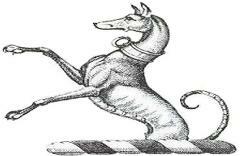 In one Persian saying, the greyhound is appointed by God to be the measure of mankind's goodness or sin. It is in the Old Testament that the greyhound is singled out as one of the few acceptable animals to live amongst humans. In Arab cultures, even after the advent of Islam, though the dog in general is seen as unclean, sight hounds are still highly cherished and allowed in the home. The Celtic cultures in general esteemed the sight hound so much as to bestow upon great warriors the title of "Hound" (Cu in Irish). The greyhound was seen as the very epitome of loyalty, devotion, bravery, and the most efficient of hunters.